Selected for its dwarf, compact habit, and vibrant foliage colors. New growth is rich red, changing to a range of chartreuse, yellow-gold, and orange in the summer to bronze, burgundy, and russet reds in fall. The colors complement showy clusters of dark pink flowers in early summer. Grows best in full sun in an average, well-drained soil. 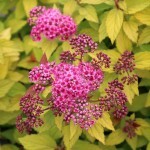 It is used in mass plantings, as an accent in the shrub border, or as an informal hedge.